Apart from the fact that, according to The A.V. 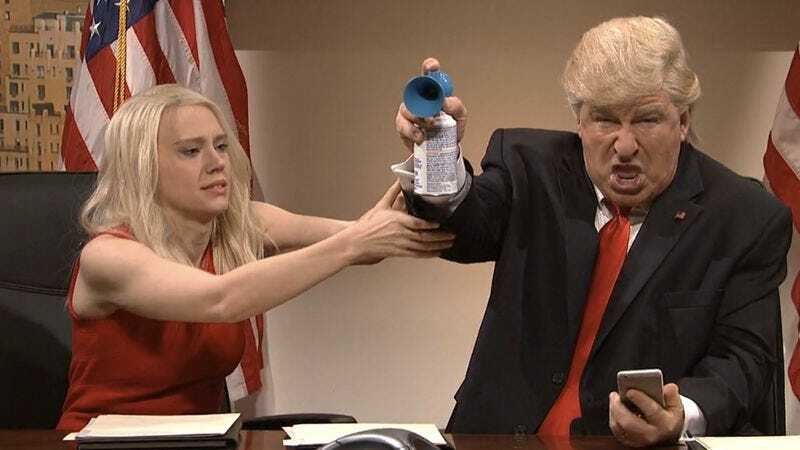 Club’s review, the Stone show was one of the strongest outings of the young season, it’s perhaps ironic that Trump chose to stay up and express his displeasure about SNL’s depiction of him during the actual show since the sketch in question was centered on Trump’s seeming disinterest on buckling down and getting ready to step into his new job. In the sketch, two aides and Kate McKinnon’s Kellyanne Conway attempt in vain to get their boss-elect to pay attention to intelligence briefings while Trump—wait for it—fucks around on Twitter. Whatever the true reason for Trump’s wrath, the fact that Baldwin is apparently content to don the orange paint and cotton candy wig for the foreseeable future should guarantee that Trump won’t have time to do anything else on Saturday nights. For which we can all be grateful.